Note: The following article is a repost from our friend Tovar Cerulli’s blog A Mindful Carnivore: Thoughts and stories from a vegan turned hunter. We loved his most recent blog post so much that we asked him if we could share it with our community of readers. While we’ve expressed some of those same sentiments here and there, it’s never been with such insight and eloquence. Tovar is able to get to the true heart of the matter in this post, and in his book The Mindful Carnivore. It’s an important work, and one of our personal favorites. Conversations about diet raise important questions concerning the ethics and ecology of food. Too often, though, these conversations get short-circuited by the certainty and intolerance characteristic of fundamentalism. One symptom of fundamentalism is tunnel vision: seeing only what we want to see. Certain that a meat-and-potatoes diet is the American way to eat, some people buy beef, pork, and poultry without a second thought. They neither know nor want to know where that meat comes from. They neither think nor want to think about actual animals, let alone about how these beings live and die, or about the broader impacts of the industrial food system. To some extent, this is simply a matter of ignorance. Supermarkets, after all, do a slick job of selling flesh in tidy plastic packages that distance us from reality. For many meat eaters, though, it is also a matter of not wanting to see, not wanting to face challenges to habits of thought and fork. Some of us cherish that comforting distance. During my decade as a vegan, my vision was similarly narrowed, both by ignorance and by my certainty that eating meat was morally and ecologically wrong. When my wife and I visited a local organic farm to buy strawberries or greens, I neither knew nor wanted to know that white-tailed deer were also frequent visitors. I neither knew nor wanted to know that the farmer got permits to shoot deer when crop damage was heavy. If I had allowed myself to see and know, I would have had to reconsider my narrow ideas about meat: Venison was a byproduct of my fruits and vegetables. Why shouldn’t the farmer eat it? If I had thought about our own garden’s dependence on manure fertilizer—or had been willing to take an honest look at all the impacts of crop production, from the deaths of millions of birds and mammals annually to habitat destruction to the exploitation of farm workers—I would have had to admit that my ethical high horse was a precarious place to ride. If I had seen these things clearly, or if I had taken a closer look at how most creatures live and die in the wild, I would have been forced to recognize that the world is a complex and nuanced place, one that does not fit the tidy black-and-white categories I had imposed. A second symptom of dietary fundamentalism is impaired hearing. When we are certain we have a lockdown on truth, it’s easy to become intolerant. When we become intolerant, it’s easy to stop listening. When we stop listening, we have little hope of understanding, let alone respecting, each other. All some omnivores need to hear is that the next guy is a vegan and, click, their minds lock shut. No ideas or questions will penetrate, no matter how reasonable. All some vegans need to hear is that someone eats animal products and, click, their minds do the same. Just like that, the Dalai Lama is recognized as a meat eater and goes from revered to reviled. Just like that, Ellen DeGeneres mentions eating eggs from a neighbor’s chickens and goes from paragon to pariah. Fundamentalism deafens us to the possibility that different people have different nutritional needs, and that those needs change over time. Following a book discussion last year, a woman told me how, after many years as a vegetarian, she had needed to eat some meat to stay healthy during her pregnancies. Her vegetarian husband had been upset and, more than two decades later, they still couldn’t talk about her occasional omnivory. Fundamentalism also deafens us to differences in circumstance. As a vegan who could afford to buy fresh, high-quality produce in New York and New England, I felt certain that all humans should eat the way I did. But diets that are feasible for you or me may not be feasible for others. In different climates and circumstances, people can buy, grow, raise, gather, catch, and hunt different kinds of foods. All too often, people don’t have enough food of any kind, let alone the luxury of choosing what they eat. Most of all, fundamentalism deafens us to the values we share. It blinds us to our common ground. At the height of my own moral certainty about the evils of meat eating, I didn’t believe I could share any food ethics with someone sitting down to a plate of scrambled eggs, let alone grilled chicken or braised venison. I was wrong. 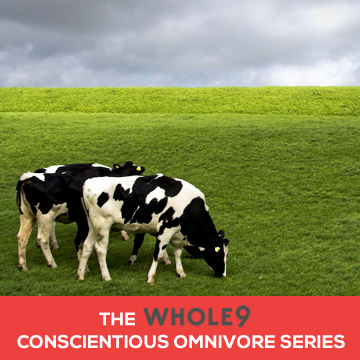 Many people—omnivores, vegetarians, and vegans alike—care about animal welfare. Many of us also care about ecological health, the fair treatment of farm workers, and world hunger. Many of us want to know where our food comes from, and want to feel connected to, and good about, those sources. Whether we know it or not, we are united by our desire for humane, just, and ecologically sane food systems. Thankfully, some of us do know. We know we can ask moral questions without slipping into moral rigidity. We know that a little tolerance goes a long way, especially in Internet forums where anonymity often undermines civility. We know that people from across the dietary spectrum can respect, listen to, and learn from each other. We know that being vegan or vegetarian doesn’t make people crazy sentimentalists, and that being omnivorous doesn’t make them heartless barbarians. And we know better than to waste energy squabbling, berating one another for what we do or do not eat. Browbeating, after all, does not change or open minds. It only hardens categories. I’m not a vegan, but I have been, and I’ve seen this a lot. The author writes this to justify his decision to cave in on his morals. This is not a piece about fundamentalism, it’s a piece about his own ego and his failure to stay consistant with what he previously believed to be an imperative. Your comment is supremely ironic, considering the topic of this article. @Caren: So, did you also cave in on your morals and fail to stay consistent with what you previously believed, seeing as you’re no longer vegan? Or did you feel you had a good reason for not continuing your veganism? Either way, it’s impossible to understand your judge-y attitude. @Melissa: Thank you for posting that! I appreciate Mr. Cerulli’s balanced perspective, immensely. @Caren, I’ve seen this a lot too…people projecting their own feelings onto other people and situations. Don’t be so hard on your ego, and the resulting decisions it causes. I completed a master’s in human nutrition last year, and one of my professors — a very experienced clinical nutritionist, said: “Check your agenda at the door.” It is so true. Not at all easy to do, but important to try to at least aim for. As a nutritionist, I have to find ways to make people feel better *within the parameters that they, themselves, are willing to set. * Dallas and Melissa address this in ISWF — while being a vegetarian might not fall within their recommendations for optimal health, that lifestyle and dietary choice doesn’t *exclude* people from being their clients or from benefiting from the book. We might not convince someone to eat meat, or to completely give up x, y, or z food. So our job isn’t to create perfect little law-abiding food nuts who never, ever stray from certain guidelines. It’s to help people along their *own paths* to better health and wellness, and not the paths we would choose for them. Much harder to do than it sounds, when all you want to do is scream at somebody to give up the darn soda/candy/whatever. I think anyone who’s been around long enough probably knows that dietary fundamentalism — whatever color it takes (low-carb, vegan, raw, etc) — is probably not conducive to the progression of knowledge. I was a devout low-carber for a long time, and I still am — FOR MYSELF. But I’ve learned and observed enough over the years that I recognize it’s not an optimal strategy for everyone across the board, and in terms of clients, everyone gets evaluated individually. I can devise the most wonderful, effective plan, but if it doesn’t jive with their goals, ethics, willingness to change, cooking skills, or budget, then it’s not worth the paper it’s printed on. Thanks to all for your feedback. Amy B, I like what you’re throwing down. Thanks for contributing your professional experience, and also your personal feelings. Thank you for your informative site re omega-3’s. There is one point that I would like to share, as in the past, I too thought that fish converted the ALA from algae to EPA and DHA. I have found out differently. Fish actually ‘collect’ the DHA (and EPA) from algae/sea greens. They don’t necessarily convert it . That’s why taking an algal oil yields so much DHA (EPA). No animal involved. Supplement (don’t substitute) if you must, and don’t neglect to “Eat your greens!” ALA from greens provides many more downstream benefits than one can imagine. ALA (and LA) are the two ESSENTIAL fatty acids.